Title: Chūnibyō Demo Koi ga Shitai! The story revolves around Togashi Yuuta, a teenager that has just become a high-schooler. And as any other normal boys would have in mind, Yuuta also thinks of an image-change, to start afresh and lead a rose-colored high-school life. He’s hell bent on a complete image change because he sees his past as a complete embarrassment, and a disaster. 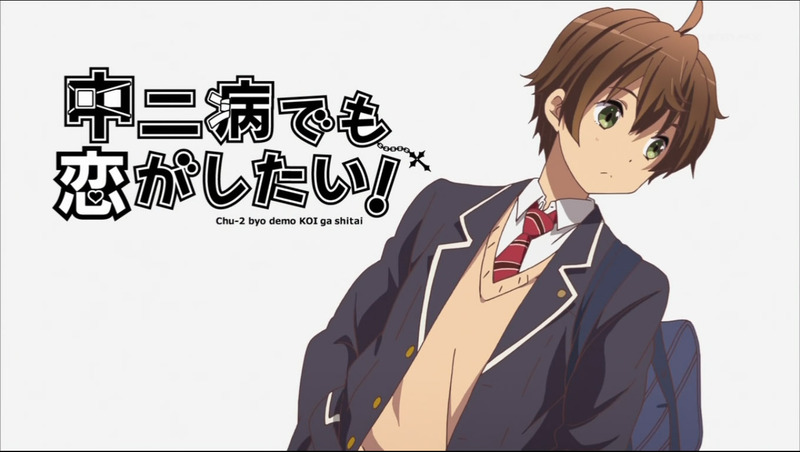 He was suffering from a disease that’s generally known as eight-grader syndrome (chuunibyou). It’s an adorable, yet dreadful disease resulting from new-found self-awareness, mixing with an overly active imagination, which results in the peculiar behavior we’re all quite painfully familiar with. 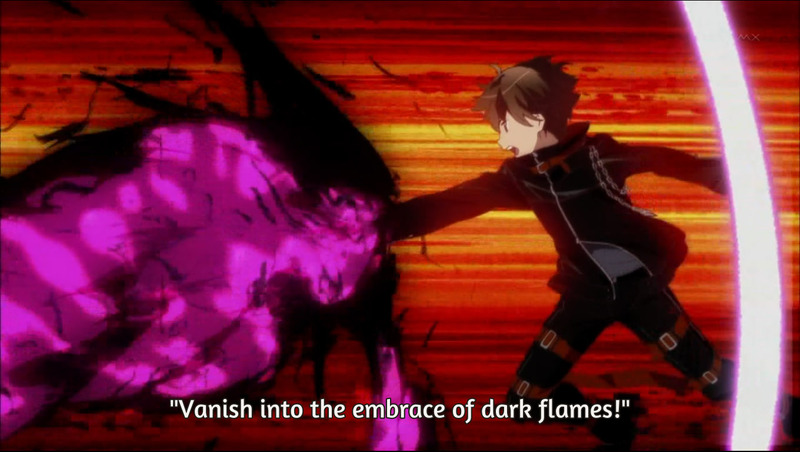 In Yuuta’s case, during his secondary school he identified himself as ‘Dark Flame Master’. He used to wear a long black coat, carrying around big sword toy, and would always spout out nonsense about the world of darkness and shout out his signature catchphrase at the end, “Vanish into the embrace of dark flames!” Now he packs all stuffs related to his delusions and says good bye forever. 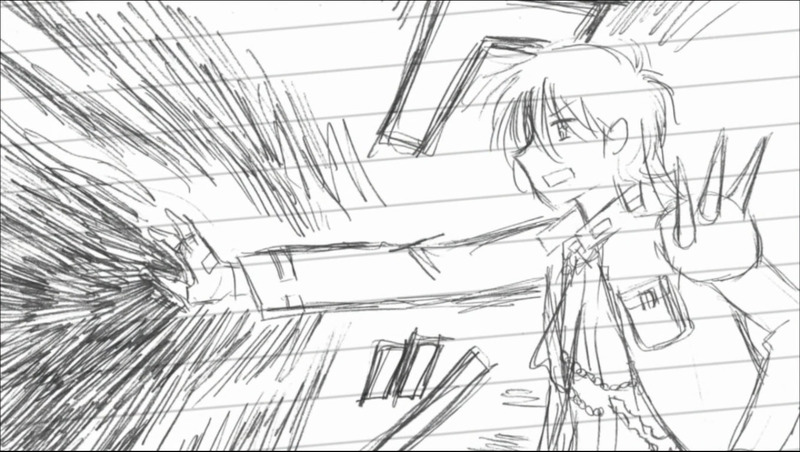 Early hours into the first day of the new semester, Yuuta manages to strike the image of a very normal classmate. He gets a male friend called Isshiki Makoto. The guys immediately hit it off well together; they talk about which girl is the prettiest in their class, and they even plan to go for lunch together with a couple other classmates. Life is good. However, the so called normal days seem to be short lived. “The moment I saw you, my wicked eye revealed to me our destiny.”, says an odd, patch-eyed girl called Takanashi Rikka who somehow seems to be attracted to him. Her sentence makes Yuuta come to a dreadful revelation: In front of him is his former self. 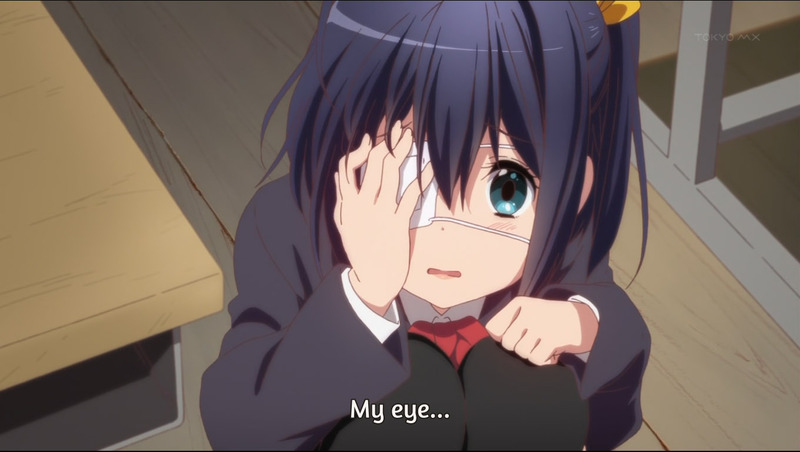 Rikka is currently suffering from a chuunibyou. 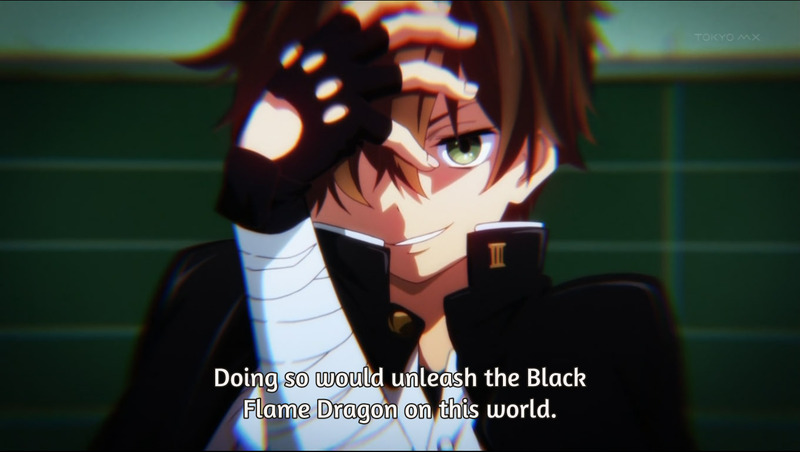 She also happens to see Yuuta making his one last ‘Dark Flame Master’ pose before finally sealing it for good. Now, he’s in trouble. Talking about hilarious opening scene, the way his past ‘heroic life’ is revealed, and the sudden reversal that follows after is a real charmer. The pacing of the story itself is just fine. It’s a rowdy but delightful journey from the beginning all the way to the end of the first episode. 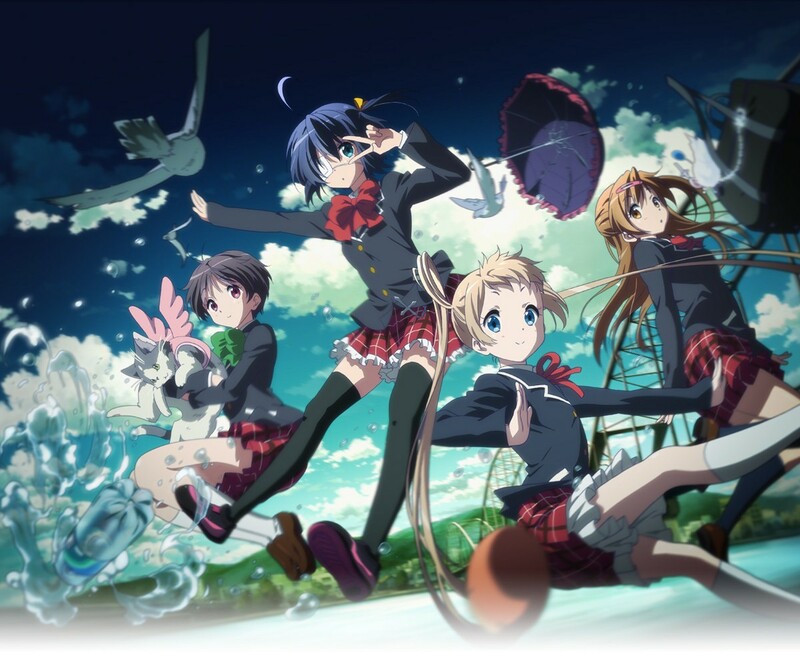 The strongest attraction force the show has is the relationship between Yuuta, the former chuunibyou who’s struggling to recover, and Rikka, the current patient who seems to be in a far worse condition than Yuuta was in before. They mutually build and deepen each other’s characters, which in this case incline to make them more of an entertaining two weirdos. It’s in between Yuuta’s efforts to get away from Rikka and her beckoning his darker side to come back out into the open that the comedy hits home. The patched-eyed girl’s bizarre actions to convince Yuuta that she has powers, and many killer battle poses, invite a few chuckles and good laughs. Her actions also radiate irresistible cuteness we can’t help but adore her. But still, there’s catch to the show. KyoAni is currently walking on a thin-ice. 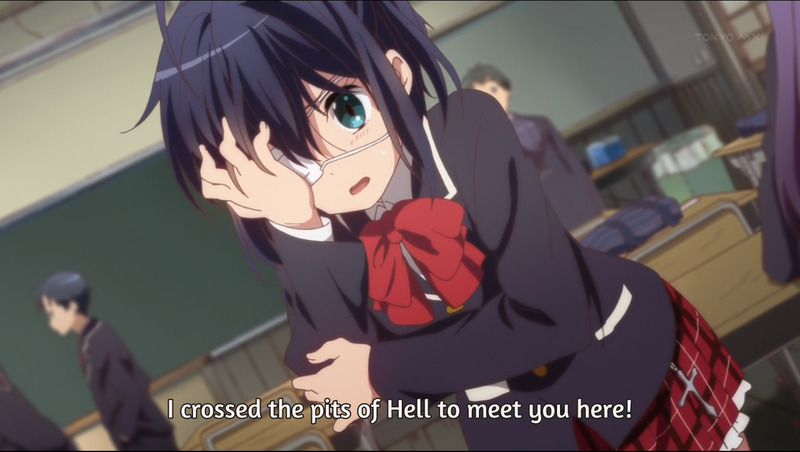 They have to be really cautious in shaping Rikka’s character in the coming episodes, as her non-sense rambling about her own world is close to become irritating in many occasions. 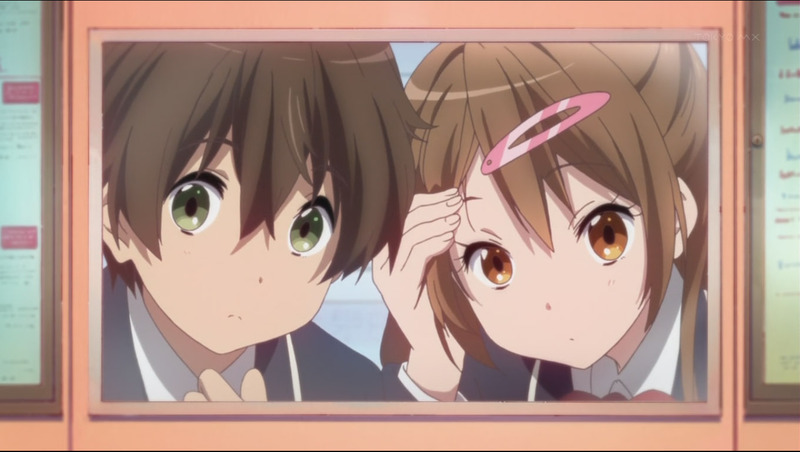 Nevertheless, “Chuunibyou Demo Koi ga Shitai!” so far is a winning package of hilariousness and heart-throbbing cuteness, with bits of emotional moments, which KyoAni has always been best known for. ← “Busou Shinki Ep.1” Automated Mini Robot Ready to Serve! saying that they’re “suffering” from chuunibyou, well doesn’t feel fit. I think i’m one of them, i have a chuunibyou, but i don’t suffer anything from it. Well, for someone who currently have a chuunibyou, i could say they enjoy they life, cause they can imagine anything, and their mind is set free. 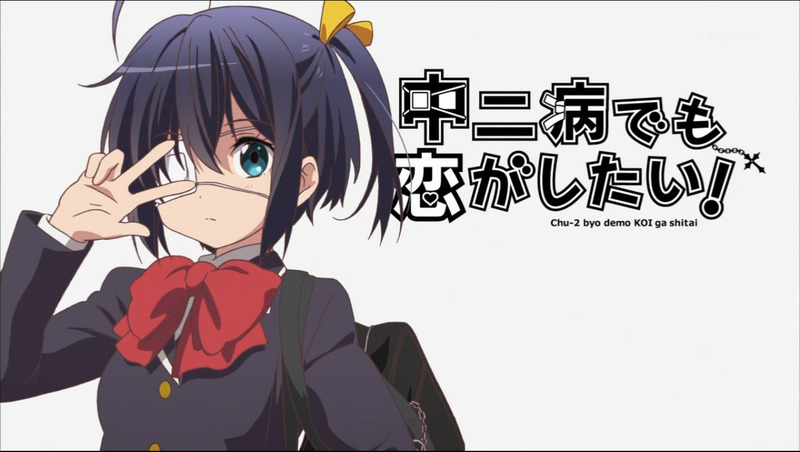 But for a former chuunibyou, it’s (maybe) pretty embrassing to remember what they do when they acted as a chuunibyou. “Mr.A is suffering from [enter the disease’s name]” happens to be the only proper English structure that I know, and since the eight-grader syndrome here is classified as a ‘disease’ in the anime, I decided to write it so. However though, you hit a bull’s eye in saying that this particular disease, in a way, is enjoyable and could make your whole life, which is already full of pressure and frustration from the hard and tiring routines of daily life, much more fun.